See why Top Companies choose us for Team Building Activities and Team Building Exercises. 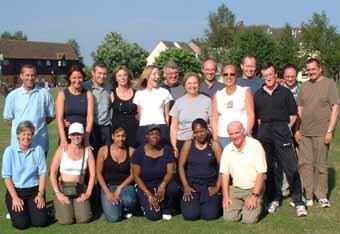 In recent years, team building events have become more and more popular with UK companies and organisations. We offer a range of activities and exercises for training in team development and teamwork. Large and small companies choose us because we guarantee a cost-effective team building exercise, activity or business game for your corporate event. a combination of competing and working together. Our team building exercises do not need any particular skills or ability. All we ask is that delegates come prepared for an entertaining and rewarding day with benefits for the workplace. An enjoying and challenging business simulation game that focuses on key managements skills, ideal for your conference, seminar or team building event. This is an exciting and fast paced business education game that recreates the dynamics of the real commercial world, helping participants develop key skills. Team members must work together to plan strategies, make management decisions and take action. They must learn from the results of their decisions and adjust their strategy and operations. Running Your Business for a Profit concentrates on the winning qualities that make an excellent team: understanding your customers, satisfying their needs, employing the right staff and motivating them so you get the best from them. It allows teams to experience and test their commercial acumen in a competitive market to see if they make a good profit. This game concentrates on the key areas of running a bunisess and allows staff from different departments to experience what other departments do. Location is flexible, so the game can easily be organised to integrate with your corporate team building event, conference or seminar. Set against the stunning backdrop of the beautiful Suffolk countryside, this corporate team building day involves a treasure hunt with a difference! Participants become detectives for the day, using creative thinking and good teamwork to gather clues and solve a serious crime. Teams also loan money to hire equipment for exercises. Success in each exercise enables them to make a profit, but who will earn the most? The result is a fun team building activity that helps with personal development. A number of indoor or outdoor teambuilding challenges provide a fun way to develop teamwork. Activities involve time management, communication, problem solving, delegation, leadership and effective teamwork. The emphasis is on success through planning, team co-operation, communication and negotiation. Enjoyable and adventurous for all participants, no matter what their level of fitness or ability. 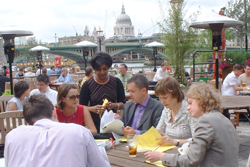 This activity provides an engaging and entertaining exercise for your team building activity, away day, meeting or conference. Our team building Treasure and Scavenger hunts take place in a town or city of your choice. Participants use their smartphones to navigate the hunt area and take pictures. This team building activity is a lot of fun and an excellent way to get to know a city or resort location. solve problem tasks and brain teasers. We will liaise with you to tailor the event to meet your needs. This ensures that your group has a great time discovering a new level of understanding which they can then carry forward for the benefit of your company. 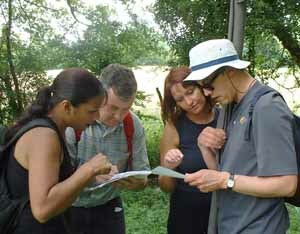 Our team building activities features London's unique history combined with a great team experience. We liaise with you to tailor the event to meet your needs. This ensures that your group has a great time discovering a new level of understanding which they can then carry forward for the benefit of your company. The business world requires more than a treasure hunt, so we have combined it with a scavenger hunt which rewards good teamwork and needs many of the skills necessary to succeed in business and in life. We have developed an app that works on smartphones and tablets to create an event that requires teams to find the answers to interesting questions about your chosen location. We can also bespoke a twist to your event by creating your own clues, challenges, questions and company branding to reinforce company values or conference messages. Participants use their smartphones to navigate the hunt area and take pictures. This team building activity is a lot of fun and an excellent way to get to know important parts of London. When teams have completed the Team Building Activities, we can provide refreshments to suit your needs. We then present the results and award prizes or medals. A business game is an indoor training exercise which reproduces a working situation in a successful business. It helps to develop individual and team performance in the workplace. Choose an exercise from a range of indoor teambuilding activities to reinforce your business plan. The exercises vary from easy to very difficult and participants enjoy the reality of the challenge. A business game exercise will help to make your indoor corporate training event, conference or seminar fun, impactive and meaningful. Our team building events do not need any particular skill or ability, but we do ask delegates to come prepared for an entertaining and rewarding day with benefits for the work place. If you are arranging team activities it is important to decide the purpose and benefits of the event before making any arrangements. Get help from our team building activities page. A reporter from the East Anglian Daily Times was sceptical of the benefits from team building. She joined a team of nurses and occupational therapists on one of our team building activities. She soon changed her mind. Click here to see the newspaper article. "From all at Copas Farms, we just wanted to thank you very much for Friday's Teambuilding afternoon. We have had tremendous feedback and it was a joy to see even the most reluctant and reserved members of staff really joining in and enjoying themselves. For over 20 years, we have been delivering excellent team building activities to businesses and public sector organisations in London and the South East, East Anglia and across the UK. Based in Suffolk means we are within easy travelling distance of Buckinghamshire, Cambridgeshire, Essex, London, Hertfordshire, Kent, Norfolk, Northamptonshire, Surrey and Sussex. We will also arrange a course anywhere in the UK or Europe.